Journey changed the game when it released back in 2012, bringing a distinctly serene experience to PlayStation owners that championed the experience of play, rather than the goal of conquering challenges. Journey generated all sorts of acclaim for its atmosphere and pace, so it comes as no surprise that Matt Nava – Journey’s art director – wanted to return to this type of gameplay when he was given the chance to direct his own title, Abzû. Trading the sandy deserts for deep aquatic environments, Abzû excels at immersing the player in an unforgettable, painterly world of life and mystery, one you’ll want to explore again and again. 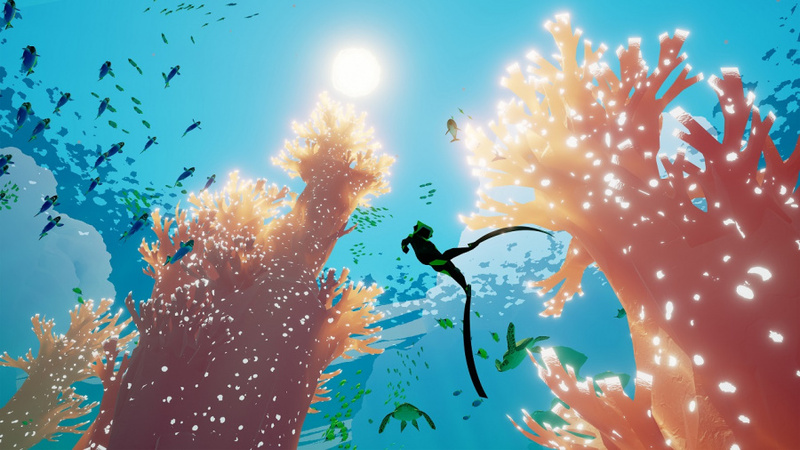 Abzû isn’t a game about having ‘fun’ in the traditional sense that one thinks of that term as it relates to gaming; there isn’t really a way to win or lose. After a seamless introduction, you’re taught the basic controls for a nameless diver and are then allowed to explore the ocean environments at your leisure, going wherever you please and enjoying the gorgeous scenery. Lazily winding around, going this way and that, is the bread and butter of Abzû; it’s about the experience of swimming around and interacting with all manner of aquatic life around you. Although there’s not any real challenge being put forth here, movement is clean, smooth and mimics the feel of real underwater movement quite well. Much like how in Super Mario 64 it’s fun to screw around a bit with Mario’s moves outside before entering the castle, you’ll find yourself enjoying the simple pleasure of doing loops around coral reefs and rushing through schools of fish as you familiarize yourself with each new environment. The diver can move quickly if needed, but the experience is best enjoyed when you’re taking it slow and drinking in all the little details. Certain statues allow you to sit and meditate, simply watching different species of fish swimming by, and if you want, you can even grab hold of the bigger ones to ride around on. Despite the open environments, Abzû is a relatively linear experience; essentially it’s a game of jumping between little sandboxes. Each ‘room’ is large enough to take about ten to fifteen minutes to fully explore, with various details like ruins, caves and seaweed forests all contributing to the diverse seascapes, and these rooms are seamlessly linked by caves and other passageways. Before moving on to the next room, there’s usually a light puzzle to solve – such as having to find a little robot or activate two rusty chain pulleys to open a door – but there’s nothing here that even comes close to stumping the player. 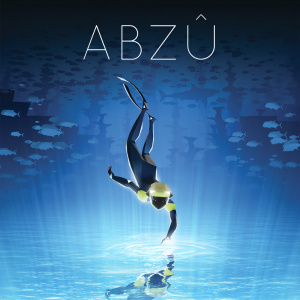 Indeed, if you’re the kind of player that needs some motivation in your gaming, like an objective or a goal to strive towards, Abzû might not be the game for you. This isn’t a game about beating levels or conquering a challenge; it’s about slowing down, paddling around and taking your time. This is the perfect game to play if you’re looking to get something in just before going to bed. 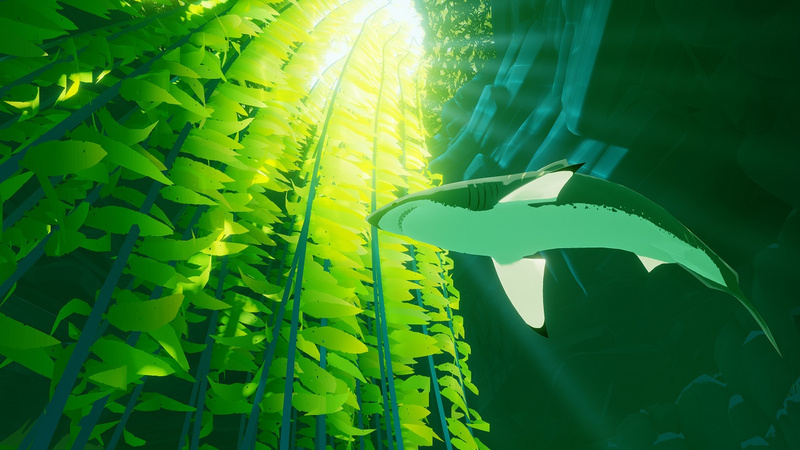 Checking out colourful fish and mysterious caves while floating around these idyllic environments is entrancing and immersive, creating a sense of involvement that many games can’t muster; the word “atmosphere” is thrown around a lot as it relates to horror, but Abzû does a fantastic job of showing how atmosphere can be used to create a sense of all-encompassing tranquillity. 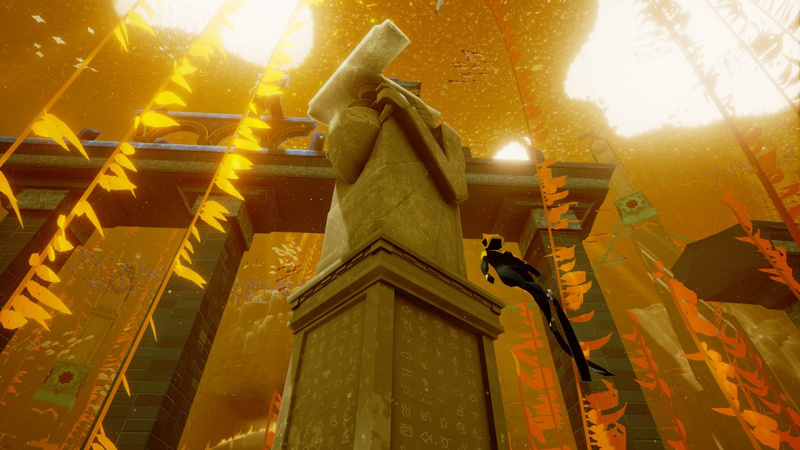 At the heart of Abzû lies a subtle story, too, about the rise and fall of an ancient underwater civilization that was destroyed by a sinister mechanical pyramid. There are no dialogue or cutscenes to be found here; all narrative is explained through environmental details like algae-covered murals on cracked cave walls or a great white shark that guides you from place to place. As one would expect, this narrative style can only go so far, but it’s rather surprising how much emotion the developers are able to coax from the silent performances; the joys and sorrows of the story hit hard in equal measure and create a real sense of investment in what happens next. This being a more experiential game, Abzû focuses on delivering a highly satisfying visual style that constantly surprises and delights as you explore the ocean depths. Graphics are drawn with a stylized and slightly low-poly aesthetic that works wonders at conveying dreamlike seascapes which all feel sufficiently fantastical, but also just real enough that you could believe they really exist somewhere. Little details like realistic ball-baiting for schools of fish or predators randomly eating lone wanderers in a flurry of bubbles contribute to making each environment feel like a living ecosystem, while wide shot moments where the camera zooms out to show off how small the diver is relative to the vast expanse of the ocean are quite humbling and thought-provoking. From start to finish you’re in for a serious visual treat, regardless of whether you’re playing on the TV or on your Switch screen. Perfectly matching these visuals is one of the most serene and melancholy soundtracks we’ve heard in gaming, expertly weaving in elements of mystery, excitement and foreboding as you journey deeper. Music is all orchestrated and some tracks even integrate the angelic tones of a choir, and there’s an element of interactivity that few games attempt to implement. The music will ebb and flow like the tide according to what’s happening on the screen; a rousing track that plays in the colourful midst of a school of fish will slowly transition to something lower and more relaxed as you enter a nearby cave. 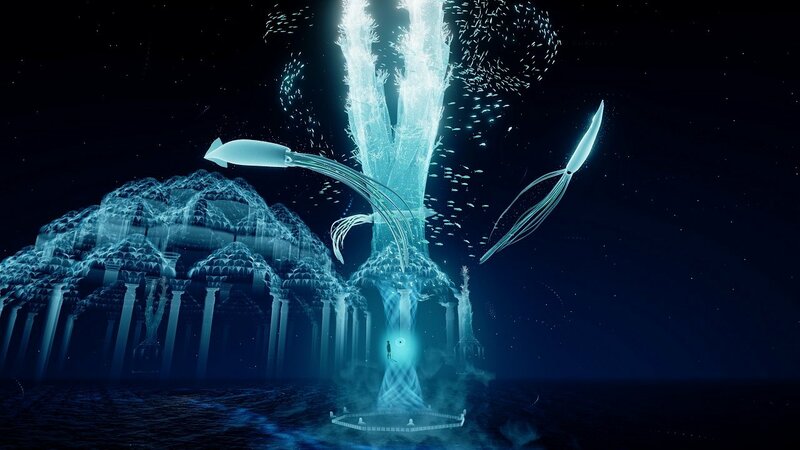 We’d highly recommend you play this in portable mode and use earphones, as the usage of 3D sound adds a notable extra element of immersion to further transport you into these aquatic worlds. 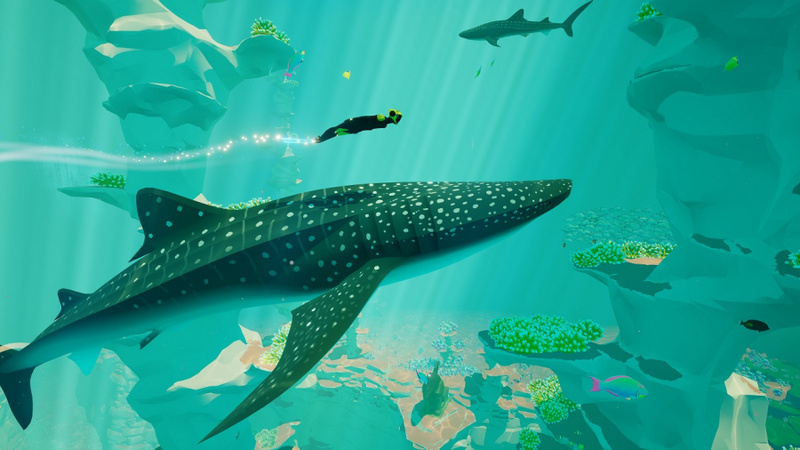 Those of you looking for a lengthy experience won’t find much here, as Abzû only takes about three hours to clear; five if you take the time to find the collectable seashells scattered throughout each environment. From a more practical perspective, it may not seem like this is a game that’s very much worth your time, but we can’t emphasize enough the quality of the atmosphere and world that’s so carefully crafted across those few hours. Abzû is a game in a league of its own, offering up an experience that’s unique, memorable and mildly spiritual in how it weaves together visuals and sound. Abzû is certainly a standout release on the eShop, offering up an experience that breaks from the norm of goal-based gaming in favour of something that’s more focused on simply existing in a world and enjoying all its little intricacies. Those of you who appreciate casual adventures like taking a walk in a forest will be sure to enjoy what Abzû has to offer, as the dreamlike visuals, entrancing orchestral score and deliberately sedate pace do a fantastic job of drawing the player into this alien world. We’d give Abzû a high recommendation to anybody looking for something a little more gentle for their Switch; it’s not a game about winning, but about the journey (no pun intended) you take getting there. Great game. Anybody with with a penchant for a journey of emotional and atmospheric impressions and moments should try this out. Anybody looking for profound and varied gameplay should ignore it. I HATED this game. It's like Journey, except with worse music and you have to squeeze a button down the entire time to move around in the water. Sounds like a solid port of a solid game. This has been on my radar since releasing on PS4, but I never pulled the trigger. Question about sound, is this game binaural? I don't like Journey-style games at all, so I know this is not for me, but I'm really happy Switch is getting all kind of great games. You should watch movies and stop playing games when you don´t want to move a stick or press a button. Not one mention of Endless Ocean? I loved those games. I think this looks great too. I quite enjoyed this one when it came out on the PS4. It's essentially Journey-lite, which is to say, reminiscent of Journey (they even hired the same composer), but it's not on the same level of quality. It's also like Jounrey in that it's incredibly short, - it's literally 2 hours long if you take your time, and there's no reason to replay it as it's so linear. It also ran really badly on the PS4, so I daren't think what a mess the Switch port must be. It's 2 hours long. The only way you could stretch it to 5 hours is if you fell asleep and left the controller untouched for 3 hours. @EasyDaRon No one wants to have to hold a button in all the time though in fairness. It's like games that don't let you click the analogue stick to toggle sprint. Annoying. Still, I don't have a solution in mind for this game in particular, just saying. Decent game, but definitely not a 9. It was trying so hard to be an underwater Journey, but only managed to hint at what made Journey such a powerful experience. It just doesn't have the same spark of inspiration. 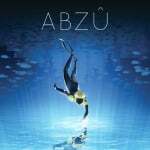 Abzu is notable more for Austin Wintory's incredible score than anything else. It's worth a play, but this review is overselling it by a mile. Interesting, I might wanna pick this up if it gets the physical release treatment, even if it's only 2-3 hours long. Got this on PS4 with PS+. Downloaded it after the kids got home from school and they watched me finish it in 2 hours then I started cooking dinner. Maybe a few minutes more, but not 30 minutes more. So while I did enjoy my time with it, a few nice oohs and aahs along the way, and it was worth the ~$3 monthly rental fee I pay for Plus, I'd be hard pressed to recommend it for $20, or even half that. Buy Guacamelee 2 instead, 10% off next week. Who knows, maybe it will be the first non-NES game to wind up on NO. "It may not really have any gameplay, and it may not have enough substance to justify the price tag, but it's art, so 9/10!" No thanks. Not my thing. So, you want racing games with cars that drive themself without holding a acceleration button? How much games do you know where you have to hold a button to move? Everything second game I have works like that. Just because it´s not you kind of game doesn´t make the scoring wrong, the price tag wrong nor the game superfluous. A lot of games with short playtime and focus on storydriven gameplay can server more experience than a lot of stupid "i have intense gameplay and probably substance but nothing more than that"-games. I preordered it but I'll wait until later, these art/experience games are for completing in one night. @Ralizah ah. There’s the rub. I loved Journey and I’d welcome a relaxing, good looking experience like this for my Switch. BUT underwater levels are my least favorite in any game due to that forced floating up business and having to hold a button down to maintain basic steadiness. So, yeah, I’m with you in this. I liked Journey enough, but these games can only entertain me so far. I may have it on my PS4 via Plus, anyway I don't invest 20€ for 3 hours of this kind. How about the frame rate, @switchVogel? @EasyDaRon good point. I don’t know why I feel it’s different for underwater stuff, but for me, it just is. I downloaded this on PS4 when it first came out. Absolutely gorgeous game. I'm even half tempted to get it again on Switch because I enjoyed that much. It's like a combination of Endless Ocean and Journey and it's probably the closest you'll get to Journey on a Nintendo console for at least the foreseeable future. Well worth a play. As somebody with real bad Thalassophobia (even Ecco the Dolphin makes my heart rate speed up! ), I'm in two minds about it. I love relaxing games like this, and I know my kid will love it, but just those screenshots alone are making me question whether or not to pay fifteen quid (£13 today, apparently) for something I'm not going to enjoy one bit! @KIRO I'm with you. I'm always glad to get out of the water in games.I think my dislike of water levels started with Sonic, hated those levels. There are the odd exceptions of course, I loved Ecco the Dolphin and quite liked the underwater sections in Tropical Freeze and Galaxy/Odyssey but other than that, I prefer to be above ground. If something that's supposed to be tranquil is invoking a deep-seated terror, then it's probably not for you. If I had have seen this an hour ago, I might have grabbed it before the pre-order discount ended in Australia. It's just released now though so guess I missed my chance, on the watch list it goes. And holding a button and holding forward an analogue stick is different. I haven't played Abzu and likely won't because I didn't appreciate Journey either. But here is someone discussing the control method and saying it's annoying having to hold in the button to swim, and here I am agreeing that it sounds annoying. Saying that it´s annoying to hold a button to swim is like saying it´s annoying to hold a button to walk. Or holding a button to drive. It makes little sense because most games work like that. It´s like "Oh my god, just by now I realize how annoying it is to press and hold buttons. How could I play in the past?" By the way: there is no pressure sensitive feature in every racing game. Nor is the feature present in any Nintendo Switch-game. @RupeeClock Ridiculous isn't it? I remember playing Shadow of the Colossus, and absolutely loving it, then that one boss came where it was a long eel type thing underwater, and I just couldn't carry on playing. It's so pathetic, but I can't help it! Haha. I'm in my 30's too for god's sake. @EasyDaRon It is annoying to hold a button to walk though... RDR2 prime example. I'm not the only person in the world who doesn't like holding in a button for a long period of time. I'm happy you're happy to do it, but I find it annoying. I don't play racing games anyway. Too annoying holding that button in. @EasyDaRon Just FYI, I'm very much done with this discussion. Have a good one. Looks gorgeous, shame its so short. Will keep an eye until physical or it comes on sale before I get it. You probably also don´t like to walk for a long period of time or hold a shopping bag for a long period of time in real life because it uses your hands and feet. Anything that goes for a long period of time seems to be asked too much of for you. Better anything working automatically. @EasyDaRon haha you've lost it mate. I prefer different control schemes to you. Please accept this is well within my rights. Oh I need this in my life. Have this on PS4 absolutely brilliant it’s more of an experience. But it’s fantastic nonetheless. Really great game. Definitely worth a buy. Very interested, but very afraid it will have a low/choppy frame rate and give me motion sickness. Will wait for comments from people who have actually played the game. I like that it is geart towards more of an experience than a 'game' I'm so glad that this has come home to Switch, it's been on my wish list a while and now it's found it's perfect platform. @iamthesunset I know phobias are irrational (just the brain's way of being a jerk imo) but I feel like there is a story behind yours. So is it any game with an underwater level or is yours bad enough that any swimming in games sets it off? I feel like you have to curate the heck out of what games you play. Not trying to pry, so don't answer if you don't want to. Just curious. @Ryu_Niiyama No worries. I have no idea where it came from to be honest, and as far as I can remember it hasn't always been there, as it never really bothered me when I was younger. Even films/documentaries that have large open water in them set me off. It's very odd. It's more to do with large bodies of open water, especially if it's dark and vision is limited. I was playing around on my brother's Oculus, and there was a demo which changed to an underwater scene, and I just about lost all bowel control. Funnily enough though, VR is what may end up "curing" it for me, if I pluck up the courage to use it. Wow, thanks for the review. I wasn't quite "getting" this game, but now I fully understand it. This and The First Tree, Old Man's Journey, Gone Home, etc are the types of "un-games" I'm into these days. Backlog you go, Abzu. Side note, I get a Dive: The Medes Islands Secret vibe slightly from Abzu. Though Dive was more "game" than this, it also had it's serene moments, but I digress. @alasdair91 @NewAdvent Not only do people spend £20 on a cinema ticket for 90min as you said, but contrary to belief, cinema visits are actually seeing a steady year on year growth in the UK - have done for the past 4 years! @ramu-chan You had performance issues on PS4? I played it for the first time a few months ago on a launch version PS4 and had no issues. Finished it over an afternoon on PS4. Nice game but wouldn't double dip. I have two very young boys who are getting into video games and love ocean stuff. Could anyone suggest what might be the minimum age range? They are not quite ready for "an emotional journey" and my older son had nightmares when he saw Bowser step on Mario's hat. Thanks for your help. "The diver can move quickly if needed, but the experience is best enjoyed when you’re taking it slow and drinking in all the little details." @frabbit Not to add to the discussion, but I'm seriously curious about your apparent aversion of the button-centered control scheme. You may feel that people are needlessly bothering you about it, but they do have a point that a very large percentage of games have this type of control scheme, and that there isn't much difference between having to press a button to run, move or swim, so no offense, but it does come across as rather odd. On a side note: most games do offer customizable controls, so that should solve most people's problems with standard control layouts. I slowly overcame my fear, first by practicing in swimming pools, going from baby pools/paddling pools to actual, full-size pools, and then on to lakes and ultimately, the sea. Nowadays, I simply LOVE the ocean, and all the beauty it contains. I picked this up for free when they gave it away to PS+ members, and it was cool to check out but in the end it was very boring. Also, swimming in video games is my least favorite thing, so I'm a bit biased. @ROBLOGNICK Endless Ocean was great. I still remember swimming over the deep chasm. So spooky. I never played Endless Ocean since I skipped the Wii. It was however one of the rare few games I wanted to play on Wii. I thought I read it was being ported to the Switch. If so, I’ll likely grab it. @LegendOfStewart Yeah, I'll second that. I've played Abzu on a regular PS4 and it wasn't 60 fps. I was disappointed in it's lack of fluidity. Will be getting this, but bummed that I missed the discounted price. I might wait for a sale now. Played it on PS4 when it was a free PS Plus title. It's alright. I completed it, but I was glad I didn't pay for it. I recommend it at about $5. @ROBLOGNICK Endless Ocean, was the (legit) inspiration behind this game. I got it for free on the PS4. It's okay, but rating it a 9 is just ridiculous. @ThanosReXXX Morning mate. Okay, this has gone too far haha. I understand why this is a confusing point, and maybe I tried too hard to defend my initial statement. Apologies to @EasyDaRon if I came across as yesterday, my back was obviously up. Now, I'm going off the game I've played most recently, which is Red Dead Redemption 2. I was playing it last night for a few hours, wandering around camp, holding in X for like 20 minutes just to walk at anything other than a snail's pace. Still enjoying the game by the way - I didn't say I wouldn't play something because I didn't like holding in the same button for a long period of time. Except, now I'm enjoying the game and at the same time I literally have a sore thumb. I'm not sure what other justification I need to give for finding it annoying to hold in the same button the whole time I'm playing a game. I didn't say I hate it, or that I'd never play this game, or that I'd retire from gaming altogether. I simply said it was annoying... because it gives me a sore thumb haha. I don't understand the problem with that statement. I know the feeling, but really, I'd rather a game be a little too shrt than much much too looooooong. @frabbit No worries, man. No one was asking you to justify anything. Personally, I was truly wondering how one could be annoyed with having to keep a button pressed to have an on screen character perform a certain action, seeing as rightly so, a number of people wondered the same thing, because lots of games require you to do the same thing. From what you said yesterday, it would seem that even playing a game of Mario Kart would be a chore, seeing as that too requires you to keep the button pressed all the time, if you want to keep moving. The confusion, well to me at least, was rather obvious. Finished playing through this this afternoon. It's very short (I finished in under 2 hours). Not bad by any means, but if there was a point to any of it, it went over my head. It's relaxing, so I guess that's something. I'd recommend waiting for a sale. Abslutely. That's an example of doing a long game the right way. A short game done the right way would be one you'd enjoy playing many times over, from start to finish. I've always felt that short games packed tightly with art, challenge, and variety can hold just as much value as a long game. 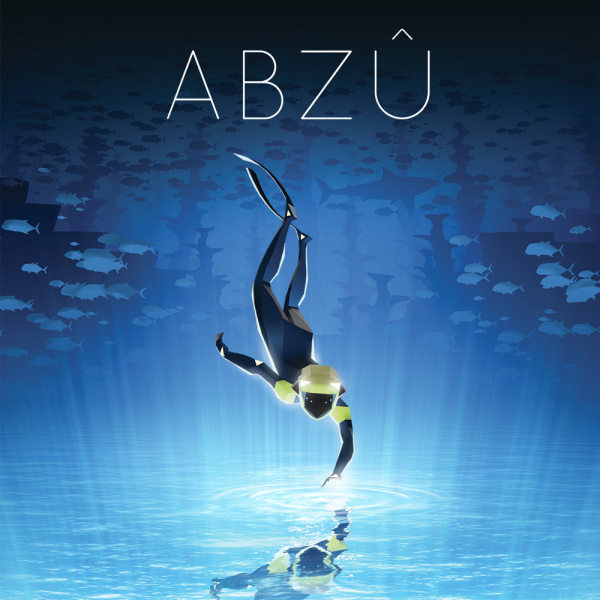 I'm not necessarily talking about ABZU here, as I haven't played that. But a game like Turtles in Time takes less than an hour to beat, and is a blast every single time you decide to do that. @Kimyonaakuma Thanks for mentioning Flower, that's the one that really pushed the envelope. As much as I thoroughly enjoyed Journey, it's still you in control of a humanoid character trying to get the equivalents of powerups and levelups. Of course, this is doing a disservice to Journey, but it's only because Flower is so much more out there. In Flower you play as the wind in a flower's dream! I'm curious to try this one out, it looks nice and I enjoy short games because I can finish them in one sitting. Boring! To me, the whole point of video gaming is to have goal-based gameplay, otherwise it's not an actual "game" at all!